I got more than I bargained for at this year’s Talons Challenge at Beaver Creek. Not only did I score Talons street cred by completing the 13 bump runs flanking Grouse Mountain, but I also gave my body one heck of a quad-burning, core-channeling workout. How’d it happen? 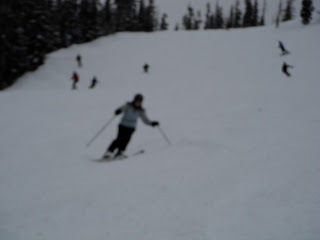 Hitting those moguls all day. Now I know skiing all day burns massive calories—why else would I reward myself with a brat and beer and still be starving for dinner? But until now, it didn’t click that my running muscles were working in overdrive when I hit the mountain. That's good news for this runner who's skiing instead of churning out miles to prep for the Boston Marathon. Check out this workout I'm getting on the mountain at buzz.snow.com.